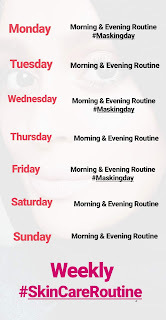 Ok, my ladies, we have completed a week and have been using our basic method to start and maintain our skincare routine. Morning routine wash/cleanse followed by a toner and moisturise. Evening routine the same steps as the morning but instead of cream I am using oil at night plus lip scrub and balm to leave the lips feeling smooth. 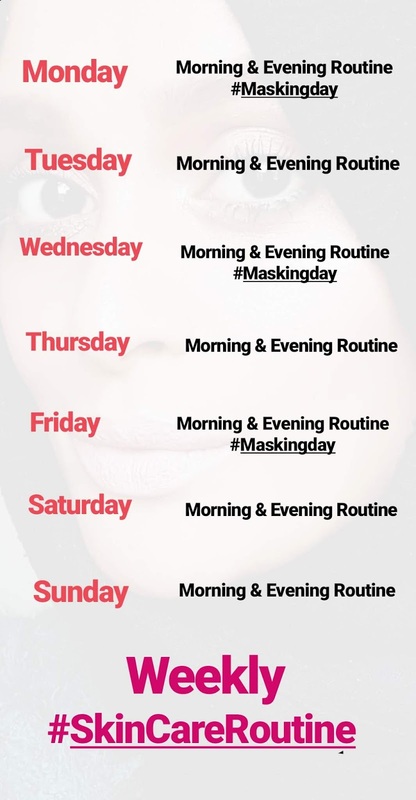 With the daily routine, a weekly routine of masking 3 times is added. This helps to deep clean and exfoliate skin in better ways than just a daily wash. As well as daily morning and evening routine a weekly routine is a must. Ok so well done to everyone involved and has completed the week. Let's keep this going and we will see more results. Now I can see a difference with my skin after a week. Can you? If not of or you feel it isn't working. Be patient your skin is slowly getting used to this new routine. You're getting used to this new routine. It's all a big change. When you haven't been looking after your skin for years you really can't expect miracles. I wanted to start you all with the basic then gradually add on other important products or facts for skincare. The one line I want to add this week is SPF. I have researched more and noticed this is an important part of your routine as this will help with ageing, fine lines and other facts on our skin surface in the long run. Will talk about SPF more in detail in tomorrows post.